The text below is taken from the biography on "rocknfish", probably by Warren . Photo of John Warren. From left to right: John Warren, Buckminster Fuller, Unknown Man. 1983. From Warren's website, accessed 2012. 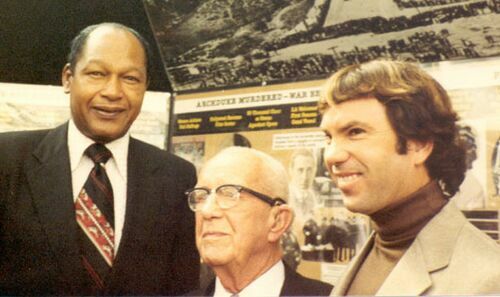 Image above is from left to right, Mayor of Los Angeles, Tom Bradley, Buckminster Fuller and John Warren. This image was taken by George Fisher during the dedication of the Los Angeles Bicentennial Information Center at Pershing Square. A graphic time line created by Richard Saul Wurman illustrating the history of Los Angeles is in the background. The display is sheltered under Buckminster Fuller's Six-frequency Fly's Eye dome. Date is 1980. Born in Corona del Mar, California, 1946, Warren graduated San Diego State College in 1970. He began work in construction, and in the early 1970's his composite manufactured portable fiberglass shelter called Turtle Dome came to the attention of Buckminster Fuller. From 1975 to 1983 he worked with Fuller. 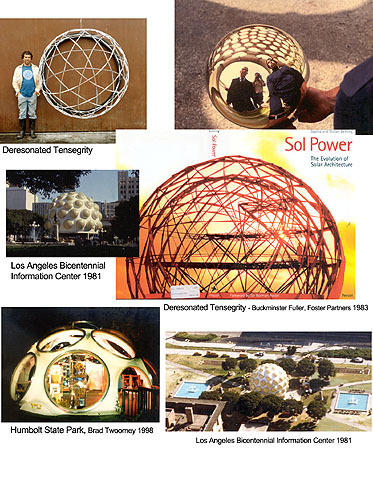 He built several full scale prototypes of previously un-built geodesic domes that were described by Buckminster Fuller. On these, Warren did the geometric analysis, master pattern creation, tooling fabrication, part fabrication and assembly, working with the Molded Fiberglass Concrete Forms Company in Costa Mesa, CA, a subsidiary of Morrison Molded Fiberglass of Ohio. Warren colaborated on three large structures called Fly's Eye domes. Continued work was done with dome designer Brad Twoomey of Humbolt California. A 24' Fly's Eye dome was fabricated and fitted out. This structure became the basis of a travelling exhibit of Fuller's work in Europe. Upon the death of Buckminster Fuller and the subsequent cancellation of the Deresonated Tensegrity Geodesic Dome with Norman Foster and Partners, John Warren was compelled to go into the field of composite tooling of earthstation antennas. He worked for the Miralite Company in Santa Ana, California. They sent him to South America where tooling and an antenna was constructed with local labor and materials. This tooling later served as the basis of an antenna manufacturing company in Bogota, Colombia. This company has now made hundeds of antennas from the tooling. Upon return to California, Miralite employed John to build a 5 meter diameter offset-fed antenna which served at the time as a unique up and downlink for educational networks. After the Fly's Eye domes, Warren worked on the "Deresonated Tensegrity" with Sir Norman Foster and Associates, of London. It was to be a 50 foot dome covered with a 60 foot dome. Due to the death of Buckminster Fuller in 1983, this project was cancelled. The deresonated tensegrity is visible in this photo montage. From Warren's biography website. 1970 Kauai, Hawaii, Construction, Art Sales. 1970-1972 Art Sales, Construction, Composite manufacturing portable fiberglass composite shelter called Turtle Dome. Introduction to Buckminster Fuller. 1973-1976 Composite tooling, Coast Catamaran (Hobie Cat) This experience included master pattern making, welding, all phases of composite tooling and prototype manufacture. The product produced was primarily tooling for the 18' Hobie Catamaran. 1975-1983 Work Association with Buckminster Fuller . During this time interval several full scale prototypes of previously un-built geodesic domes were described by Buckminster Fuller. Responsibilities included geometric analysis. Master pattern creation, tooling fabrication, part fabrication and assembly. John worked with the Molded Fiberglass Concrete Forms Company in Costa Mesa, CA, a subsidiary of Morrison Molded Fiberglass of Ohio. Three large structures were created titled Fly's Eye domes. Subsequently a project was initiated with Sir Norman Foster and Associates, of London with a novel structure called "Deresonated Tensegrity". The termination of this time period was marked by the death of Buckminster Fuller. 1983 Bogota Colombia SA. Project manager and composite tooling specialist for a joint venture between a Southern California company, Miralite, and a Colombian Company, Cosmotec, in order to create tooling for a 7 meter (24') diameter parabolic earth station antenna in Colombia. In a two month time period the antenna was created and put 'on-the-air' . This tooling became the manufacturing basis for the Colombian corporation. This tooling has now produced dozens of these earth station antennas. 1984-1987 Employment by the Miralite Company as project manager for the creation of a unique 5 meter (17') diameter 'off-set' focal point parabolic reflector for a transmit-receive antenna for communication earth station networks. These antennas were utilized by corporations and educational institutions for teleconferencing. The subsequent 1986 disaster of the space shuttle Challenger marked the functional end of the Miralite Company. Communication satellites were suspended from Space Shuttle launch. Since then the Miralite Company has been resurrected. 1987 Employment for Jet Propulsion Laboratory as an 'on-site, project liaison' for the Deep Space Antenna Network upgrade in preparation for the historic Voyager 2 spacecraft 'Neptune Flyby'. The product was an interim 30' diameter composite subreflector for the DSN antenna in Australia. This large precision component was built at an aerospace company in San Diego under contract with NASA. 1987-1991 Employment with the design firm Dubin and Moore , Laguna Beach, CA. Responsibilities included accurate drafting from rough sketches through manufacturing and installation of 'art furniture' and architectural patination. Primary client was Steve Chase and Associates, Rancho Mirage, CA. Other Dubin and Moore projects included Art in Public Places installation titled 'High Tech Totem' with Developer Leland Enterprises. 1991-2003 Self-employment as independent fine artist in the field of sculpture and furniture. Primary sculptural method is fabricated steel including stainless. Outdoor and indoor work has been produced for Southern California and San Jose del Cabo in Baja California, Mexico . Currently most of the year is spent in fulfilling commissions. From this period of time John Warren has been continuously remained an exhibitor within the Laguna Beach, Festival of Arts. The Festival of Arts is an institutionalized, jurried art exhibition that runs from July through August annually in association with the Pageant of the Masters. Trios Gallery in Solana Beach, CA represents John Warren. Biography of Warren, rocknfish.com/BioWarren.html, accessed April 2012. Now offline. This page was last edited on 28 November 2018, at 18:11.